Start by dissolving the sugar in the water in a large saucepan over a medium heat. Peel the lemons taking just the yellow skin, not the white pith. Slice the lemons. Remove the pan from the heat and add the citric acid and the lemon slices and lemon peel. Stir well. Add the elderflowers and press them down into the warm syrup. Leave to steep for 24 hours. The next day, line a colander or sieve with muslin or even a cut-up nylon stocking and place over a large bowl. Sieve the mixture through the muslin until you get a clear, honey-coloured cordial. This can then be stored in glass bottles or jars in the fridge or freezer for up to three months. To serve; simply dilute with chilled water. What a lovely addition to your blog. I loved hearing your voice and watching you prepare this cordial in your own kitchen. What a lovely, refreshing summer treat. 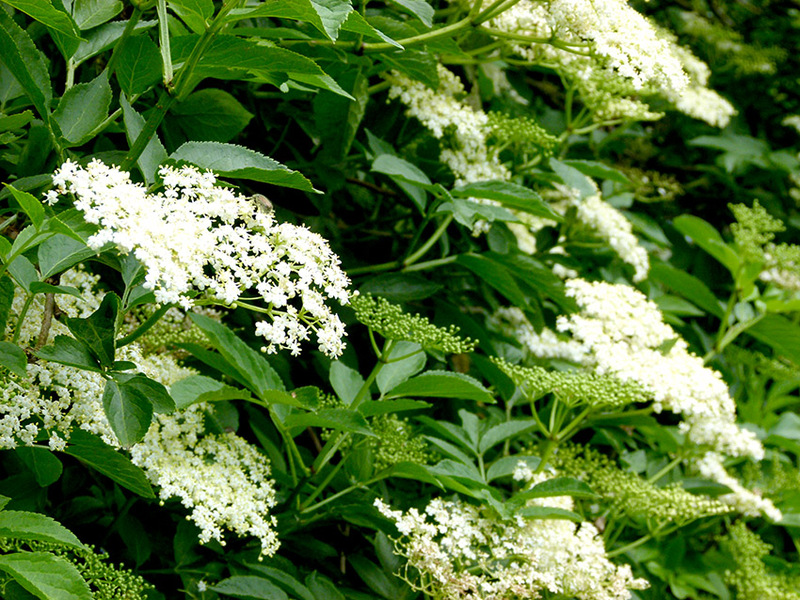 Though I’ve visited England five times, I’ve never tasted anything made with elderflower (to my knowledge). My first introduction to it was at the coverage of the recent Royal Wedding. What I love about your talking us through this is that you used fresh, beautiful ingredients grown on your grounds, and you chose a simple, but elegant recipe to share. Your husband is fortunate to have a lady with your skills who uses them lavishly. I also like everyone else do things all at one which means it is all half way there … my husband does love the countryside and its gifts! I love the in your kitchen videos! Today’s recipe sounds absolutely refreshing! I wish we had some Elderflower around my house!! Thank you for this recipe!! I love it when I add it (St. Germain) to my Bond Martini. LOL Thank you for your delicious recipes. Thats a great one! Those elderflowers look like – wait for it – the weeds we have here in CA mostly at the coast in the Redwoods – I used to play “Wedding” with them and make little bouquets, then the procession would end in the house – Mom would say ” Oh you have playing in the weeds again” – HA! They also look like the Queen Ann flowers on our East Coast. Never the less – I still love them and they are beautiful! Thanks for the recipe – will try with real Elderflowers…. You make cooking look so easy! I can’t wait to try this recipe, Lady Carnarvon. You are such an inspiration and I love to try new things. I enjoy your blogs so much and am already looking forward to the next great recipe! What a wonderful recipe! I look forward to sipping it over the summer. It looks delicious and refreshing. Elderflower grows wild in Puget Sound, Washington, a beautiful coastal community south of Seattle. I am visiting my Aunt Sharon here. After watching your video, we’ve decided to take a walk in the woods and collect Elderflower heads. We can’t wait to try your cordial recipe! Would you care to share your recipe for Spaghetti Al Limone? P.S. Aunt Sharon says hi! Thanks for the recipe. Sounds like a great drink to have in the refrigerator for the long hot summers in California. By the way, when I saw your apron I thought, now there is a great item to merchandise in your gift shop and on line. Perhaps with photos of the Castle. I’ll be your first customer!!!! Years ago one of my British pen-pals sent me a “Harrods” apron, the kind made from heavy plastic with a cloth backing or some such material. Anyway, I have been using it for years and it still looks brand new. You are my hero because you run a very large estate, your write books, a blog, and have your hands in so many different fires and yet, you manage to do it all and stay sane. God Bless You. We love your cooking videos! It’s 110 degrees today in sunny Scottsdale …what could be more refreshing! Looking forward to the spaghetti recipe too. I’ll forward your video to my friends. I made your elderberry cordial yesterday and sieved and chilled it this morning before going to church. It’s very hot here in Western Pennsylvania and the drink is delicious. It was fun to try something new! Thanks so much for the easy recipe and video. Thank you LADY CARNARVON, for sharing this elderflower cordial video. Here is U.S. it is quite expensive to purchase one. This video of yours certainly helps. Looking forward to more of your lovely videos and posts…. Anjiline – Policy Analyst – Washington D.C.
Lady Carnarvon – I made my second batch of Elderflower Cordial this week. I have been serving it over ice with sparkling seltzer water and my friends love it. I also served it once with sparkling white wine and that was also delicious. Also made a pound cake and added the syrup in lieu of vanilla flavoring. Then I made Elderflower curd and served over the pound cake. About 4 lbs of elderberries, 2 tbsp. lemon juice, 4 1/2 cups sugar and 1/4 tsp. butter to keep foam down, 1 packet Sure jell pectin. I cooked my elderberries in a large kettle with stems and all as I was going to make jell not jam. I strained the juice and berries through a cheesecloth. Added the sugar to the juice and lemon juice and cooked until my spoon was coated good and juice seemed to be thickened. Add the butter as needed to the cooking if it foams up. I did NOT use the pectin because the lady that gave me the recipe said the berries have so much natural pectin that I didn’t need it. My jell came out lovely – just the right consistency. I’ve made it twice that way and both times it came out great. To be on the safe side you could add the pectin or try it both ways. I have a hard time getting my berries as the birds love them and try to get them ahead of me. Your elderflower cake sounds delicious – thank you. Thank you Lady Carnarvon. I must make this. Elderflower has such a wonderful scent and flavour. I make elderberry brandy by steeping a couple of tablespoons of elderberries in a jar of brandy for six to eight weeks. Very good for chasing away a cough or a flu. Elderberry brandy sounds like heaven! Thank you. I do hope you enjoy the recipes. I was looking for the recipe for Elderberry Curd the precious entry mentioned. Is it the same a Jell? I thought to ask my family who still live up north to search out some elderberries for me! We had Elderberry Cordial when we stayed in Newbury last fall for Heroes at Highclere. It was so refreshing. I just loved it. Now I want to try every recipe you mention containing Elderberries! When I was a child in Ohio we used to go for Sunday drives in the country always looking for Elderberries growing wild along the side of the road. Great memories. Thank you!